Honestly, I’ve never really had a problem with clowns. I’m not going to sit here and say I don’t find them kind of creepy, because they definitely are, but I’ve never found them so creepy that I developed a paralyzing fear of them. Even as a kid, probably through my love of Krusty the Klown, they never really bothered me. That being said, I definitely understand their use as horror fodder and Dropsy is no exception. A horrifying, bulbous figure with a gaping, toothless smile doesn’t immediately conjure images of fun and joy. Dropsy is the clown that the folks around town are wrong about. Dropsy initially caught my attention a few months ago when I read an article about it on The Escapist. From the initial images, the game looked trippy, scary, and interesting. Finally getting my hands on the game, it was nothing that I expected and an overwhelmingly enjoyable experience. Dropsy is the tale of a clown on the road to redemption. The entire town blames him for a circus tent fire that took place five years ago, resulting in the death of his mother. But despite the hate and blame, Dropsy is determined to help the townsfolk with their problems, not to prove to them that he’s good, but because that’s just his nature. The story delivery very minimalistic with only a small handful of cutscenes. Most of the character dialogue is delivered with cryptic images in speech bubbles. The entire story is shrouded with mystery, and Dropsy has more secrets than even he knows about. Minor bits of story can be gleaned from sleeping, which randomly generates either pleasant dream sequences or horrifying nightmares. Overall, it’s an interesting and engaging story that keeps you guessing until the very end. Dropsy is a proper return to the classic point-and-click adventure format; not adhering to the modern point-and-click styles developed by The Walking Dead, The Wolf Among us, and more recently King’s Quest. Movement is handled by clicking on wherever you want to go, and picking up every item that isn’t nailed down is essential (and if it is nailed down, find a hammer to get the nails). While it isn’t as cryptic as some of the early Sierra titles, solving seemingly everyday challenges in an obtuse, out-of-the-box fashion is what makes up the fun of these games. Puzzles become increasingly challenging as the game progresses; however, Dropsy won’t face them alone. As his quest progresses, Dropsy is joined by animal companions that help him and give the player a wider range of actions. 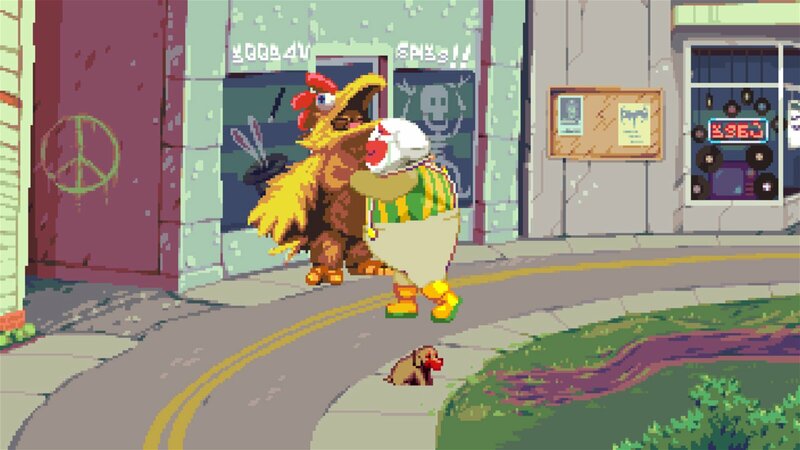 Being called a “point-and-click hugventure,” the main goal of Dropsy is to hug as many people, and sometimes things as possible. This is where the bulk of the challenge comes from: trying to figure out every person’s problem in order to solve it and earn a hug. 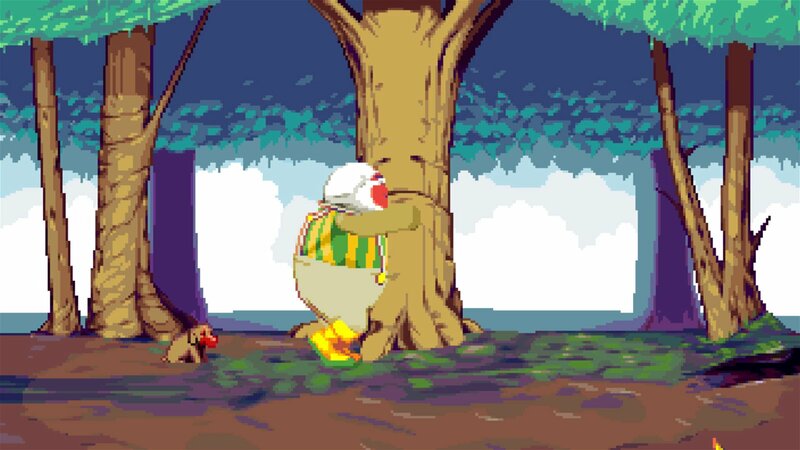 Hugging people will earn the player a picture that goes up on Dropsy’s wall, and the hardened completionist will find a greater challenge in trying to get them all. The music in Dropsy is beautiful and strange, which fits perfectly with the game itself. Every theme perfectly fits the atmosphere of each screen, from the plucky yet odd tones of carnival music that accompany Dropsy’s home, to the sombre saxophone howls that build a city at night, draped in sadness. There are so many variations on Dropsy’s “theme” that perfectly suit every situation, changing with the atmosphere and driving home the idea that is his indeed his story; his game. I honestly don’t know what more to say about it, it’s beautiful. Here, listen for yourself! Dropsy’s got an amazing aesthetic that works extremely well in the 16-bit pixel art style. Despite being rather simplistic graphically, Dropsy is full of colour and life. There are a wide range of emotions displayed by the characters and each one has an interesting and complex design. The game’s day to night cycle adds to this, constantly changing the colour scheme and maintaining the feeling of a living, breathing world. There’s a moment where you find a preacher lady sitting on a slide, smoking and staring into the distance where you can really see how little she believes what she’s preaching. Dropsy’s design himself is immensely creepy, yet oddly loveable, which I think represents the game as a whole. Dropsy is the clown that the folks around town will tell you about, about how great his game really is. It’s bizarre, thought-provoking, and challenging enough to keep you invested for hours. It’s an amazing experience in a world that feels so massive and lively that it’s easy to get lost in. Taking into account how much the Steam community has pulled together to solve the puzzles and help each other out, Dropsy shows just how far a little love can go. Dropsy initially caught my attention a few months ago when I read an article about it on The Escapist. From the initial images, the game looked trippy, scary, and interesting.